Of course RY will play the "it got deleted somehow" or "I am so morally outraged at this invasion of my personal privacy into my website account..." cards and will be able to mitigate a lot of the damage to himself. And of course, this where LRC presents the "missing" strava data to Jaime Fuller so that he won't be deceived by Rob's trickery. I think I'll add a post to http://ryinvestigation.blogspot.com so everything about that incident is in one spot. The implication here, I think, is that Robert Young ran through the desert trail until the main Hwy, where he is then walking. It's preposterous to believe he all of a sudden turns on the jets for a 34 mile sub-7 UNSUPPORTED run with like whatever teacup for water the Brit had (I never saw any serious hydration equipment) to Laughlin. 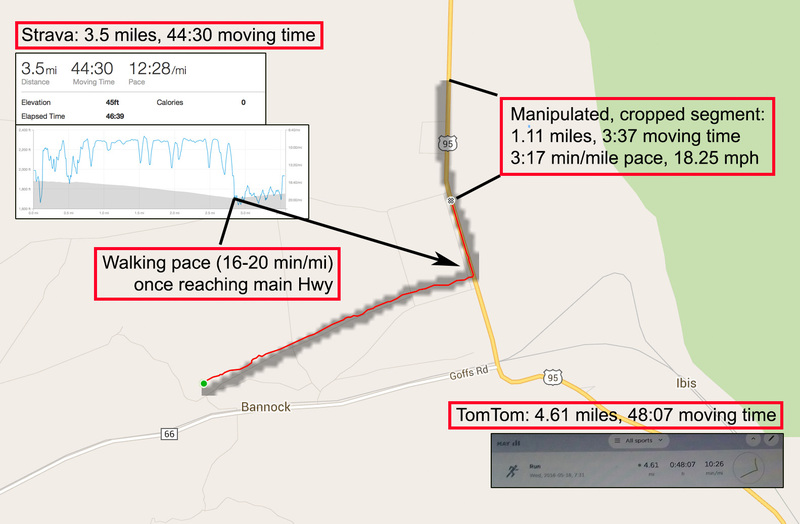 Instead, based on his manipulative behavior of cropping this run, the more likely explanation is that while walking he was waiting for a ride, or offered a hitch, got in a car, covered the additional missing mile rather quickly forgetting to turn off the TomTom - and had to delete the evidence. Any chance Strava keeps data backup even though these asshats deleted the files? Anyone have friends at Strava? I'm near certain that their web server logs would capture IP addresses from which every upload takes place. Getting them to analyze those server logs is another questions altogether. Perhaps someone can reach out to Strava and beg them to preserve those logs. Thanks. Oops got some simple math there wrong and perhaps I'll add another Strava screenshot snippet for proof, but that's the idea. I would think that the @StravaEng group would readily have the skills and tools to figure it out. These tech companies take a pretty big stand on privacy. See recent Apple v. FBI. It opens the floodgates once there's one incident of "we just gave away someones personal info". I doubt this would ever happen. Not for Rob Young. A subpoena for a terrorists planned routes or something - mayybe. Right now he has 59,590 likes. Earlier today, he had 59,621 likes according to the Google Cache. On June 4 he had 59,085 likes. It's great work uncovering the doctored data, but his fanboys aren't getting to hear about this. Keep posting your findings on his page. Getting his fans to realise what he is is really important. I really am losing all faith in humanity if there is a need for you to have to justify yourself. no decent person ever doubted you ! A thousand trolls can't beat Rob. He'll win this little battle on his way to greatness. SKINS won't be so stupid that they'll let this genuine runner and human being leave them. Time to give it up, trolls. Hi lame troller that can't even bother to put in the effort to troll well, how is your day going? It's frustrating, but useless. Those people are like anti-vaxxing flat earthers. Plus they seem to have someone watching 24/7 and scrubbing comments within seconds. - Was the cadence and HR data scrubbed from all his Strava runs, even from those in his "sandbox"? Because I saw a screenshot that said "device: TomTom" and I would assume that runs coming straight from his watch can't be scrubbed? - Do all his runs use GPS data, so no manual mapping like he did for his first 3 marathons (MapMyRun)? - How many miles are missing on Strava? - Did he really disable the FlyBy function? @StravaEng Possible fraudulent WR attempt needs your skills to bust. LetsRun.com "Robert Young fakes run across America"
How dare you! I'm no brain-washed globalist or a member of Rob's fan club. The earth is flat, water doesn't flow uphill or curve. Don't waste your time. 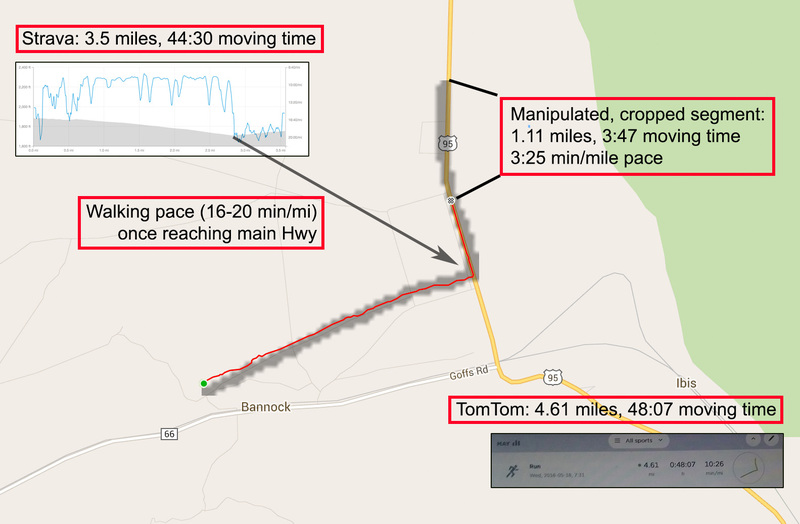 Strava or TomTom will never release his data, unless a court orders them to do so, because of his privacy. It is better to tweet to SKINS or Lucozade, their CEO's, to Dustin or Michael... They have to feel the pressure. -Yes, I believe so. Don't know why the difference in "Device". Maybe one went through another conversion or something. I'm not suggesting Strava Engineering release the data. I'm suggesting they internally apply data analysis to the data to determine if it is fraudulent. It is easy for them to do so. Yes but wouldn't that require looking at parts of activities that were cropped, private activities, etc - invading privacy? Worth a shot, I'm just skeptical.